Help me build MiniVMac for Rhapsody. Hi, I’m trying to build MiniVMac for MacOSX 1.2 Server aka Rhapsody 5.6. 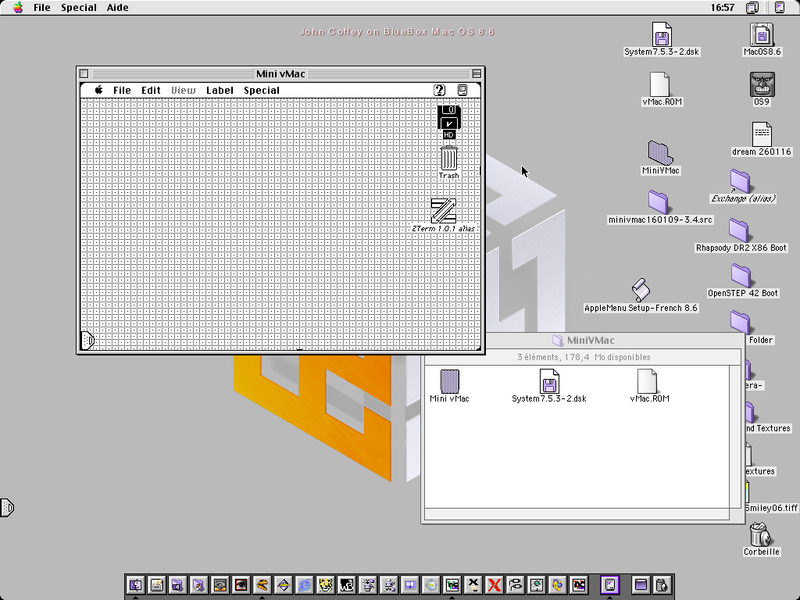 Work very well, so though it would be nice to have MiniVMac run natively on rhapsody. I contacted the MiniVMac author, he gave some leads. 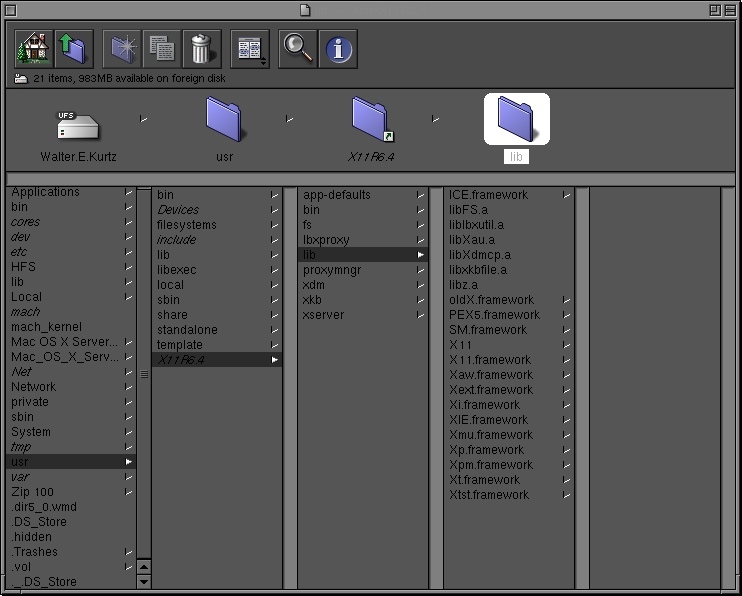 Like that the Free/Open/Net BSD ports of MiniVMac use the X Window system. so I think this is the way to go. I’ve installed GCC 2.7.2.1 on the MacOS Server. then grabbed minivmac160109-3.4.src sources. Prepared some few builds with differents options for try compiling on Rhapsody. I’ve did a FreeBSD for PPC (-t fbpc option in MnvM_b34). And tried building these in Rhapsody. No success. I don’t know whats going wrong here being no coder at all. Any help would be very appreciated Would be fun to have MiniVMac running (dancing ?) on that old Rhapsody. Your build script appears to look for the files /var/tmp/cc000NNN.s, which it isn't finding. Maybe it's a permissions issue? What happens on a more modern PPC build of Darwin running X11? This might help you isolate things. That said, it seems to me that your best bet would be an OpenSTEP/NeXTStep PPC target, as that's pretty much the same as Rhapsody. I seem to recall there being such a target at one time on the Gryphel site; http://www.nextcomputers.org/forums/vie ... php?t=2265 seems to agree, but it looks like that might not be currently be working. i've tried doing "make" as root, or even login as root , and it still make the same error. var/tmp folder as root as owner. Didn't know there was a NeXT PPC target for MiniVMac ! Will check for that. Funny thing is that all the lines appearing after I do a make are the content of the MINEM68K.S file in the MiniVMac sources. You could try compiling without the assembly language file, using -no-asm in the build system. Ok, tried again today with a -t fbpc -no-asm. Then tried a -t xgen -no-asm on another rhapsody machine with no other compilers than the Apple OSX server dev tools. I've also tried build a -t xgen -cpu ppc on a PPC machine (iMac G5 running 10.4). With the Makefile line $(ObjFiles) -L/usr/X11R6/lib -lX11 as default. By the way, the closest supported build system options are probably "-t mx11 -no-asm -cl", for Apple X11 for PowerPC, using no assembly, and built with command line tools. For these options the build system thinks the X11 directory is "/usr/X11R6/", so you could replace that in the generated make file with "/usr/X11R6.4/". anyway, I've tried a "-t mx11 -no-asm -cl" build, changing "X11R6" to "X11R6.4" whenever I found it in the makefile. If there is no "Xlib.h" file, then your system is not set up to compile applications that use X. By the way, did you try using the mppc standard version of Mini vMac (for Macintosh OS 9 and earlier on PowerPC)? According to Wikipedia, it ought to work on the PowerPC version of Rhapsody, in the Blue Box emulation layer. Yes, seems if I want to have it running natively on rhapsody i would have to install an X11 from scratch :/ Not using maX or Xnext ... Don't know if that as been done before, will check. That's good that the mppc version works. Actually, I don't think an X11 port on Rhapsody is really more native than using BlueBox. They are both compatibility layers. And the X11 version probably wouldn't work as well as the mppc version - at least, the X11 implementation in OS X, which presumably descends from the Rhapsody version, seems to lack some things, like proper full screen support and drag and drop. Truly native would be to use the Cocoa port of Mini vMac (build option -api cco). The Cocoa port is intended to work back to OS X 10.0. I don't know how Rhapsody differs, it might work unchanged, or some work may be needed to get it to compile.